Driving while distracted can make it difficult to react during a potential crash, especially for teen drivers. More than 1200 videos created by teens to inspire their peers to drive more safely and avoid risky behavior were submitted in the TeenDrive365 Video Challenge by Toyota and Discovery Education. Among the 10 finalists is Caleb Kravitz '20! 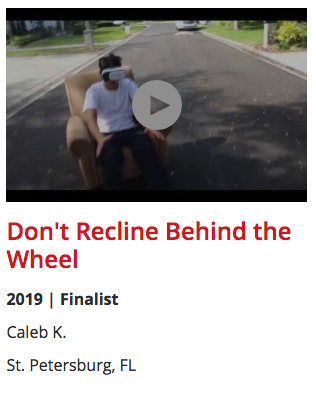 Caleb’s video "Don't Recline Behind the Wheel" and the other ten finalist videos can be viewed at teendrive365inschool.com/vote. The public can vote for their favorite video once per day through April 23. The People’s Choice winner will receive $5,000 - so please vote for Caleb every day! Caleb used the video to give an important message to his friends. “For teens who use their phones while driving, it can wait. No text is worth your life,” he said. In addition to the People’s Choice winner, several other prize winners will be chosen by a panel of judges comprised of community leaders, educators, communications experts and Toyota representatives. The Grand Prize winner will receive $15,000 and the chance to work with a Discovery Education film crew to reshoot the winning video as a TV-ready PSA. Upper School students were able to view Caleb’s video and other student-produced films at a recent arts assembly.